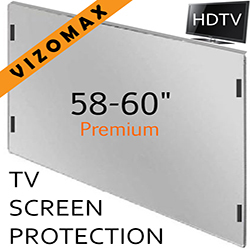 58-60” Vizomax TV Screen Protector is a crystal clear shield that attaches to a flat-screen TV and protects the fragile screen from damage. Special optical-grade plastic is as clear as glass and maintains the sharp and vivid picture of any HDTV. The Vizomax LCD TV screen protector is used by Families with Children, Nintendo Wii owners, pet owners, Hotels and other institutions. Provides protection when the TV is on a stand or mounted on a wall. · Thanks to Vizomax thousands of Americans enjoy their HDTV's in complete comfort. Protect your investment today! · Enhanced protection designed with elegance that remains unnoticeable. Keeps the stylish look of your TV! · Used by Families with children, Hotels, Schools, Hospitals and other institutions. Vizomax TV screen protector is a transparent TV screen cover designed to prevent damage, scratches and fingerprints to the flat screen of a contemporary LED, LCD or Plasma TV. Vizomax is the leading TV screen protector brand in the US. 100% Clear: Proprietary optical-grade material optimized to maintain HDTV picture quality and ensures superior protection. Optical-grade technology; no material yellowing over time. Manufactured under rigorous quality standards. Polished edges and rounded corners ensure elegant appearance and complete user safety. Material treated to minimize flexing in front of the TV and ensure superior protection. Unbreakable: Heavy Duty! Advanced technology used to manufacture the transparent shield ensures that the high quality plastic is not only 100% clear but is also virtually unbreakable. Invisible: With its elegant proprietary design and unmatched optical clarity stands virtually invisible after installation. Easy Installation: Few minutes and no tools required. Just unpack and attach your new TV screen protector to your flat-screen TV. Enjoy in complete comfort like thousands across America. No covering of speakers and complete elegant appearance Guaranteed! Easy Snap On/Off detachment for Cleaning: Reclosable fasteners allow easy temporary detachment for cleaning. UV Protection: Filters out between 96% and 99% of the potentially harmful ultraviolet (UV) waves emitted by the TV screen Screen. Ventilation: Vizomax TV screen protectors are designed to allow the screen to be cooled by natural air flow. DOES NOT work with touchscreens. Dry erase markers can be used on the TV protector. Protector covers the frame and is larger than the screen. 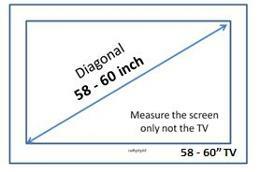 Please measure the diagonal of your screen (without the frame) or look at your screen manufacture diagonal size in inches. Although, 100% transparent and clear, due to the filters in the lens the protector may be tinted and requires that the user increases the screen brightness by up to 15%. 2. Commercial: use in institutional setting Hotels, Hospitals, Fitness Centers, Conference centers, Meeting rooms, etc. In addition, TVs that are on all the time (or long periods of time), TVs on stands that are being moved around, industrial environment etc. Vizomax TV screen protector has the following applications: LCD TV screen protector, LED TV screen protector, Plasma TV screen protector, flat screen TV screen protector. Our premium Plasma / LCD / LED TV Screen Protector blocks 96% to 99% of the harmful UV radiation. Our antiglare LED TV screen protector, LCD TV Screen Protectors and plasma TV screen protector block over 99% of harmful UV emissions. Anti-scratch on our premium and antiglare TV screen protectors prevents easy scratching from abuse and children activities. Our TV screen protectors have increased 1/4 inch thickness that both ensures sufficient screen protection and prevents the Vizomax TV screen protector from flexing in front of the TV display. Vizomax TV screen protectors are manufactured to fit Sony, Samsung, LG, Sharp, Sanyo, Vizio, Panasonic, Philips, RCA, Toshiba, Mitsubishi, Emerson, Pioneer, Hitachi, Insignia, Magnavox, Element, Haier, Sylvania, Viore, Seiki, AOC, Proscan, Apex, Sceptre, Sceptre, Mitsubishi .. and virtually all other LED, LCD and Plasma TV’s with 26, 32, 37, 40, 42, 46, 47, 50, 52, 55, 60 and 65 inch screen diagonal. Immediate order processing (within 24h); delivery takes between 1 and 6 days. Streamlined shipping process ensures that all Vizomax TV screen protector orders are shipped immediately. Shipping TV screen protectors is typically expensive since the package of a large size TV screen protector can exceed certain parameters and trigger additional large package handling charges. All shipments are tracked and tracking number is emailed to the TV screen protector purchaser after checkout. This product is under patent protection. Vizomax TV screen protector is one that sets the standards for quality and elegant appearance in the US. If you need legal patent information about the attachable TV Screen Protector and the Vizomax brand please contact www.vizomax.com.